From Left: HELENA WALSHE, SINEAD MCCANN, ALEX CONWAY, Right Here, Right Now, Kilmainham Gaol, November 4, 2010. O’Toole wrote the above in reference to the ‘In a State’ exhibition, hosted by Kilmainham Gaol during the summer of 1991, the year Dublin was chosen as European Cultural Capital. The show involved specially commissioned work from twenty-one leading Irish artists from north and south of the border, and from Catholic and Protestant backgrounds. But Toole’s statement regarding the “tension” between heritage and culture is outdated. Since then, heritage has lost it’s patriotic bite. Economics has tamed our ‘Irishness’. The now ‘spent’ Celtic Tiger not only symbolised the voracious growth of the Irish economy, but signified a step outside of ourselves as a distinct culture. The term Celtic Tiger refers to Ireland’s similarity to the East Asian Tigers: South Korea, Singapore, Hong Kong, and Taiwan during their periods of rapid growth in the late ’80s and early ’90s. For the Irish , and the world at large, the Celtic Tiger has come to represent black-hole capitalism. The offshoot of this inflated consumerism is culture and heritage are forgotten. As our economy contracts, the obvious psychological reaction will be a growth in our patriotism: ironically, this is something that we can sell, Leprechauns and all! 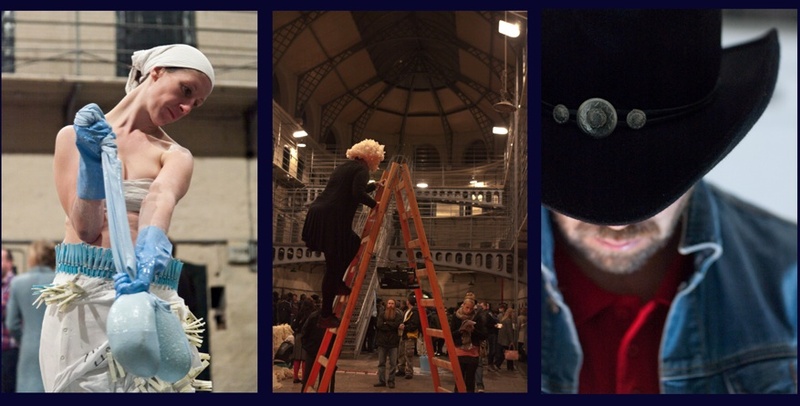 This reflection on heritage, patriotism, economy, was offset by the collective, live durational performance art event sited at Kilmainham Gaol, Dublin, on the 4 November, 2010. Under the banner ‘Right Here, Right Now’, 20 performance artists were allocated space on the ground floor of Kilmainham Gaol. Some roamed freely, while others chose to stay within the prison cells, or within a controlled site of props. “Durational’ is a common word within performance art vernacular. The four hour live event could only manifest itself properly, conceptually and experientially, if the viewer was willing to stay for the duration. The idea of duration is especially pertinent if you consider the site of Kilmainham Gaol. The general function of the ‘prison’ is based on two principals of experience: confinement and temporality. The latter has become the main tenet of contemporary art. In this sense, the event was less about performance art defending its sidelined position as a misunderstood art form, and more about the ‘aesthetic relations’ between art, site and Time. Kilmainham Gaol is one of the more significant artefacts of what was the Irish cultural imprisonment under British rule. Against this historically potent backdrop, you have to ask the question: how can performance emerge from the revolutionary shadow of Irish history. Perhaps the fact that history (nostalgia) is being continually consumed by the future (desire) affords the potential for such an event to take place at what has become a Victorian husk of forgotten history and cashed-in patriotism. HELENA WALSHE, SINEAD MCCANN, ALEX CONWAY_Right Here, Right Now Kilmainham Gaol_November 4_2010. [Artists] exist in constant tension between heritage and culture, between the forms and feelings that they inherit from tradition and the living confrontations with change that they have to create themselves. Fintan O’Toole, quoted in the essay ‘Kilmainham Gaol: Interpreting Irish nationalism and Republicanism’, by Pat Cooke, the curator of Kilmainham Gaol.